DC Keys (center) stands with President Kent C. Trachte (left) and Dan Miller, vice president for student life. 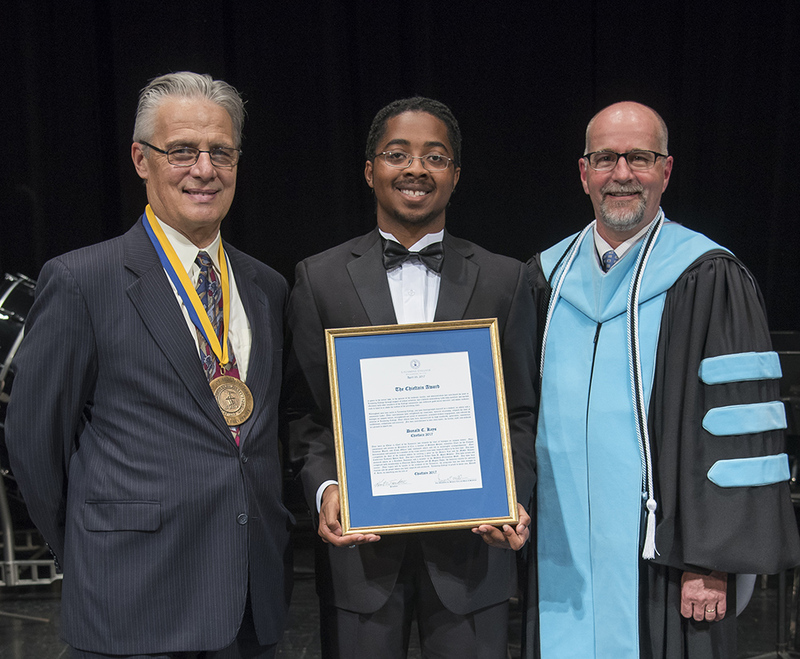 Donald (DC) Keys of Erie, Pa., was awarded Lycoming College’s Chieftain Award during a ceremony on April 23. 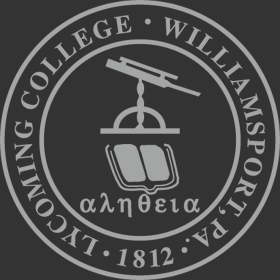 First presented in 1952, the award is the highest honor given to a graduating senior and recognizes the student who has shown the utmost dedication and leadership qualities while at Lycoming, and whose academic rank is above the median of the preceding senior class. Keys’ academic honors include being named to Dean’s List all four years at Lycoming and being inducted into the economics (Omicron Delta Epsilon) and political science (Pi Sigma Alpha) honors societies, serving as president of Omicron Delta Epsilon for two years. In addition, Keys earned the Rabold Economics Excellence Award and completed the academic requirements to graduate as an Institute for Management Scholar and a Lycoming Scholar. He worked four years on the student newspaper, The Lycourier, with his last year as its editor in chief. Other activities include involvement with the Student Senate, Dance Club and Campus Activities Board including two years as CAB’s treasurer. He also served as the president of the Christian-based club, Cru, for three of his four years on campus. He was a student orientation staff member, resident assistant and economics tutor. In his senior year, he interned at the Lycoming County Planning and Community Development and served as the senior class treasurer. Keys was a member of the men’s cross country team and earned the Arthur Ashe Jr. Sports Scholars by Diverse Issues in Higher Education. He also earned a spot on the Middle Atlantic Conference Academic Honor Roll each of his final three years. “DC’s legacy will be visible in the archives of the Lycourier, the programs that he brought to fruition and the people he has inspired and mentored,” said President Kent C. Trachte. During the award ceremony, Keys also earned the 2017 Roger W. Opdahl Economics Excellence Award and the J Marco Hunsberger Service to Lycoming Award. This fall, Keys will pursue a master’s in international economics and finance from the Paul H. Nitze School of Advanced International Studies at Johns Hopkins University.